From the Admin tab, navigate toAdmin>Setup>Configuration>FAQConfiguration. A new checkbox is available, Allow Faculty to Post Question. Uncheck the box to hide the Ask a Question button. When emulating a faculty member, the Institution FAQs will now be available to support accounts. A new checkbox, My Evaluations, has been added to the Access Settings page under theRights*heading. Selecting both the Emulate and the My Evaluations options will give access to the View/Respond section of Evaluations (link on the Menu). Essentially, the faculty member is giving access to his/her evaluations Note: this access does not include the ability to perform an evaluation on behalf of the faculty member. Click AccessSettings from the left navigation menu. Select both the Emulate and My Evaluations checkbox. Optional: Enter any notes in the Notes field. The faculty member for whom access was granted will be listed under the heading Access Granted to My Account. TheAccess Rightscolumn will indicate the level of access (i.e. My Evaluations and Emulate). Click Access Settings from the left navigation menu. Click the faculty members name under the heading Accounts I Can Access. A message displays indicating the faculty member to be emulated. Click Okay. Note: If your institution wishes to utilize this administrative option, please submit a Support Ticket for this feature to be turned on. 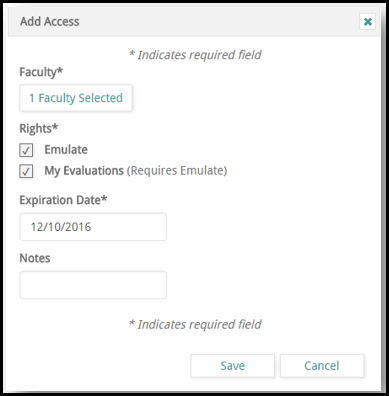 From theAdmintab, navigate to Administration > Tools > Set Faculty Optional Scholarly Data. A list of faculty displays. 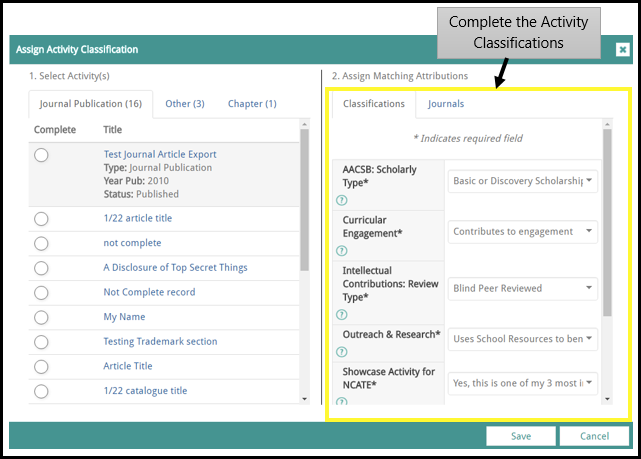 Select the edit icon for the faculty member for whom you wish to update activity classifications and/or journal outlets. Then click an activity to display the details for the item. The details for the item display on the right side of the screen. 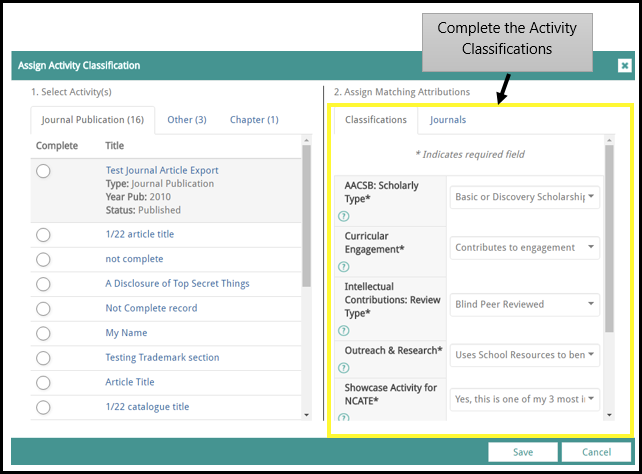 Select the appropriate value for the activity classifications. Note: The record cannot be saved until all required activity classifications are completed. 0%(Empty white circle)There are activity classifications AND journal matches which must be set (or there are no journal matches). 50%(Half white/half teal circle) There are activity classifications OR journal matches to set (or there are no journal matches). 100%(Full teal circle) The activity classifications are cleared AND journal matches are cleared (or there are no journal matches to clear). 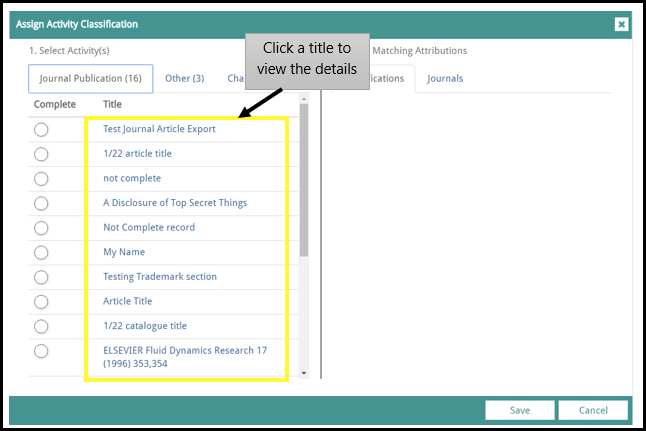 If the feature above has been enabled, after importing activities, a new link will appear on the dashboard titled Set Optional Data for Imported Scholarly Works. Note: If no activity classifications, then it would be excluded from this feature. After clicking the 'See Optional Data for Imported Scholarly Works' dashboard link the list of imported activities displays. Click an activity (i.e. Journal Publication, Other, Chapter, etc.) to display the details for the item. 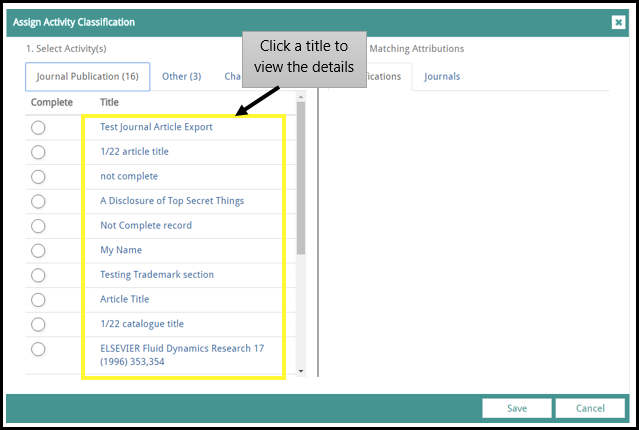 Click the Journals link to view possible journal matches. Select the appropriate value for the journal. 0% (Empty white circle) There are activity classifications AND journal matches which must be set (or there are no journal matches). 50% (Half white/half teal circle) There are activity classifications OR journal matches to set (or there are no journal matches). 100% (Full teal circle) The activity classifications are cleared AND journal matches are cleared (or there are no journal matches to clear).